Come experience the thrill of Dungeons & Dragons….Creative Surfaces is producing several of these Dungeons & Dragons signs for Konami Gaming. The games will be placed in pods and each sign is built with glowing runes, faux stone elements, and hand painted 3D toppers. Konami will be unveiling all new slot machines at this year’s Southern Gaming Summit and National Indian Gaming Association (NIGA) Gaming Show. 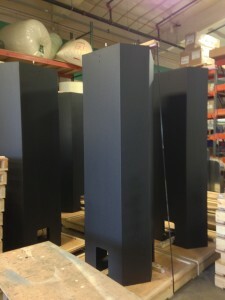 At Creative Surfaces we have 25+ years of custom designing interior signs for the casino and gaming industry. Creative Surfaces is a full service interior casino sign manufacturer that includes design and development. All of our signs are built to suit, building some of the biggest and brightest signs that have every detail and dimension to attract the most attention to your sign and enhance your visitor’s experience. On many of our signs you will notice LED chasing lights, flashing neon, large LCD monitors for video imaging (some signs include multiple monitors), push-thru lettering and backlit signage. As well as designing and fabricating, we also install all of our own interior casino signs. 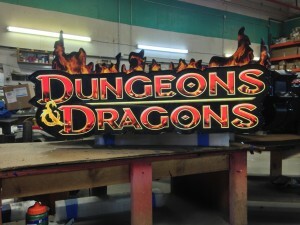 Dungeons & Dragons sign bases. Dungeons & Dragons backlit sign.